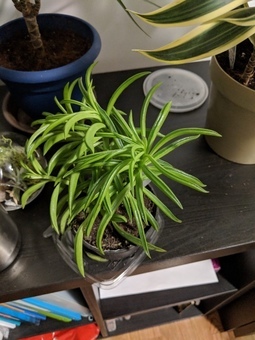 plant ID and how to propagate? What's the name of this plant? I accidentally knocked off a branch while moving it around and and wondering if there's any way I can plant it? Enid Hernandez Peperomia ferreyrae - Pincushion Peperomia? Not sure. Pei I am it's a type of succulents, just not 100% sure the name. 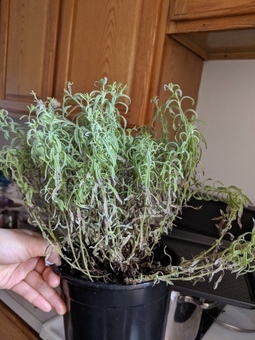 It looks like it needs to be repot! something is eating my basil..
these dots/patterns have been forming on my basil plant, and after some time it completely dries out the leaves. What is it? What can I do about it? and are the basil leaves still safe to eat? PlntNrd Are any of the areas sticky at all? It definitely looks like you have some sort of pest. You can see by the mottled leaves that are drooping. Now you just have to determine what exactly it is. 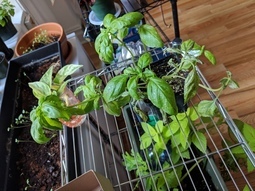 The first thing I would do is isolate that basil plant away from all over you other plants to try to keep the infestation from spreading. naturally forming roots around pothos? I purchased this huge pothos plant some time ago, and they've come with these brown things that look like roots. I'm now trying to propagate them and took a few cuttings and have them in water, but I wonder if these brown parts are themselves roots and I don't need to sprout new roots before I can plant them? 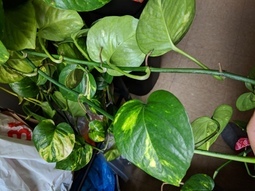 How should this pothos plant be propagated? Also, why are these roots forming in plain air? PlntNrd Those are nodes and they roots will form from those. They aren’t actually roots or aerial roots. If you take a cutting, make sure it has these nodes, along with multiple leaves, the roots will grow out of the nodes the are either in water or soil. I bought this lavender pot from Trader Joe's in February. Whatever I do--give water, don't give water--it seems to be unhappy and more and more of the bottom half is drying out. It sits on a window sill facing East but doesn't get an exorbitant amount of light. For example, its neighbors are dracena kiwi, pothos, and prayer plant and they seem to be doing fine. Any ideas for what might be happening? another Whole Foods purchase.. help with ID? 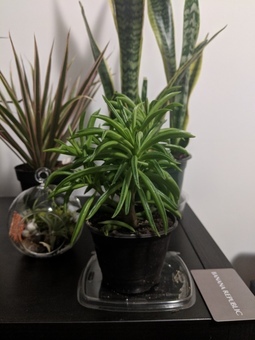 I bought a small version of this plant at Whole Foods a few weeks ago, but don't know what it's called/what the appropriate care strategy is... any advice would be much appreciated! Pei It's a Zebra plant in Acanthaceae family! Zebra plants like indirect birght light and warm and high humidity environment. I would suggest to water once or every 10 days and mist it as often as you like. Make sure to put it away from drafts, AC, or radiators as it usually evaporate the water and humidity quickly! 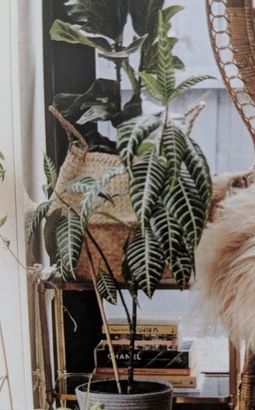 PlntNrd If you bought a small plant with leaves like this, it might be a zebra plant. Google that and see if that looks like what you have.